Surrey ended day three with a lead of 217 with three second-innings wickets left, after Essex captain Ryan ten Doeschate earlier hit an unbeaten 168. Ten Doeschate started day three on 120 and extended his total before being left stranded with Essex on 435. Simon Harmer then took four wickets for Essex, and Jamie Porter three, as they kept the hosts to 253-7 at the close. Ben Foakes (46 not out) and Stuart Meaker remained not out, while opener Rory Burns made 57. It leaves the match finely poised with both sides capable of victory on the final day. Essex added 68 to their overnight score with Neil Wagner (34) offering the most assistance to Ten Doeschate. All of the Surrey top order then made starts in their second innings but failed to capitalise and fell at regular intervals. 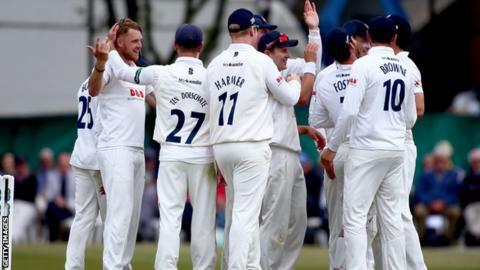 South African off-spinner Harmer dismissed Scott Borthwick (36), Kumar Sangakkara (26), Sam Curran and Gareth Batty, while Porter took the wickets of Burns, Mark Stoneman and Dom Sibley.